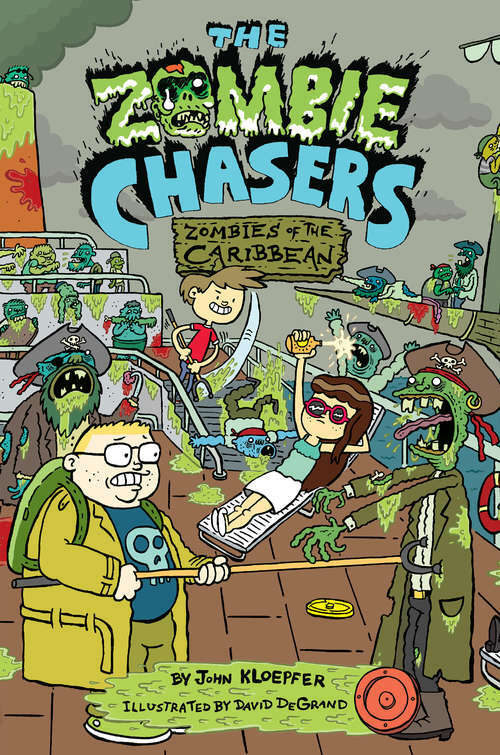 The Zombie Chasers take to the high seas in the sixth installment of John Kloepfer's hysterical Zombie Chasers tween series, illustrated by David DeGrand. Zack Clarke and his team--Zoe, Rice, Ozzie, Madison, and Olivia--have fled the infested coasts of Florida, chased by a ravenous mob of super zombies. With no antidote in sight, there's only one person who can help them now: an eccentric explorer and renowned zombie expert . . . but he's lying low in a zombie-proof bunker somewhere in the Caribbean. As the pals fend off decomposing pirates, crusty crewmates, and putrid sea creatures, they race to uncover the cure for zombies everywhere. But will they be able to defeat the zombies of the Caribbean before the cure and their plan go overboard? With all the middle school shenanigans, fast-paced adventure, and hilarious black-and-white drawings that have made this series so beloved by reluctant readers everywhere, The Zombie Chasers #6: Zombies of the Caribbean is a gore-larious romp not to be missed!